Safe Working at high altitudes, for example creating openings in conjunction with fire ventilation, always involves risks. To guarantee safety during such work it is necessary for the personnel to have the proper equipment, to be well trained, and aware of the risks associated with the work. A full harness with peripheral equipment, or support equipment in the form of a fire belt or seat harness, is used when working at high altitudes. Only a full harness is approved as fall protection in accordance with the EN standard. Support equipment systems are, however, completely dominant in the Swedish fire and rescue services. A fall protection system (full harness with accessories) is used to secure a person at an anchorage point, so that a possible fall would be braked in a safe way. Full harnesses are, for example, used when working on masts and in structural engineering. A support equipment system (fire belt or seat harness with accessories) is used to prevent a fall and to provide support during the work. Support equipment systems are used, for example, when working on roofs, rappelling (lowering), and for work on poles. in addition to a seat harness/fire belt. Safety measures must be taken when working in conditions where there is a risk of falling. 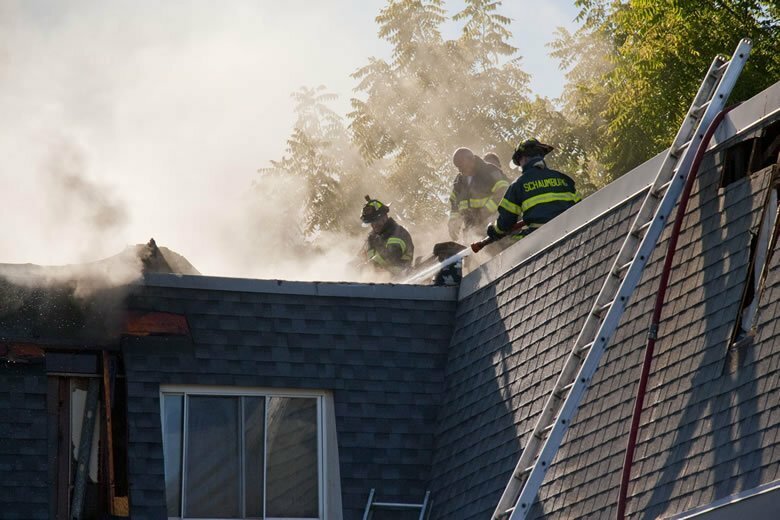 When working on a roof, or from a ladder truck, in conjunction with fire ventilation it is most often advisable to be secured. can consist of synthetic rope, ribbon, wire or chain, and is an integrated part of both the conventional fire belt and the seat harness in the Rescue Suit 90 used by the Swedish fi re and rescue services. The connecting line to the fire belt consists of a chain with attendant spring safety hook. The applications for both these items of equipment are rather limited for obvious reasons. It is mainly a question of securing yourself when working on a ladder, mast or the like. To achieve a larger working area on the roof it is possible to use a ladder truck as an anchor point for a line, sling or a fall protection block. resulting force if the person should fall. Such an anchor point could be a chimney, a roof ladder or a rail. A safe escape route should also be created if possible, for example by placing and anchoring a ladder on the roof. As far as is possible this should be used as a work platform. The actual creation of the opening should be carried out in such a way that there is always a safe escape route. The first cut in a roof should be made away from the work platform (ladder or ladder truck), so that the last cut can be made while standing on the work platform. It can often be advisable to establish some form of standard operating procedure when working at high altitudes, the intention being to create a safe escape route and a safe work platform.